We describe a hybrid nanoadsorbent prepared by depositing graphene on the zeolite clinoptilolite by chemical vapor deposition. The resulting sorbent is well suited for the preconcentration of lead(II) and cadmium(II) by ultrasound-assisted dispersive micro solid–phase extraction. An extraction unit has been designed and manufactured that facilitates handling of small sample volumes. The effects of sample pH, amount of sorbent, concentration and volume of elution and time of ultrasonic bath were investigated. The nanoadsorbent was characterized by scanning electron microscopy, X-ray diffraction and energy dispersive X-ray microanalysis, all of which revealed the high surface area of the graphene sheets on the clinoptilolite. The extraction recoveries when using the new nanoadsorbent are 97 % (as opposed to a mere 10 % in case of clinoptilolite only). It is assumed that the graphene sheets located around the porous structure of clinoptilolite are acting as a barrier against macromolecules potentially existing in the sample matrices. The method was applied to the determination of lead and cadmium in water and human serum samples by electrothermal atomic absorption spectrometry. The detection limits were as low as 70 and 4 ng L−1 for Pb(II) and Cd(II), respectively. The accuracy of the method was underpinned by correct analysis of a standard reference material (SRM: 203105 Seronorm Trace Elements Serum L-2). New nanoadsorbent, graphene/ clinoptilolite hybrid, was prepared which is suitable for separating and preconcentrating the metal ions from biological samples. 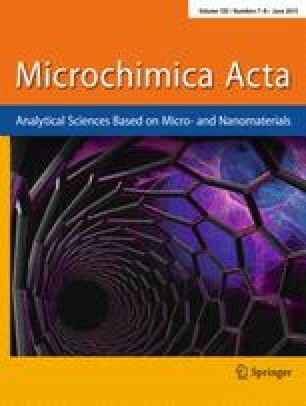 In the propose method, the synthesized G/CL nanoadsorbent was used in ultrasound- assisted dispersive micro solid phase extraction method with applying the new designed extraction unit. A hybrid material composed of graphene and the zeolite clinoptilolite is shown to be a viable nanoadsorbent for separation and preconcentration of metal ions. It was applied, in combination with a newly designed extraction unit, to ultrasound-assisted dispersive micro solid-phase extraction of Cd(II) and Pb(II) from water and serum samples. The online version of this article (doi: 10.1007/s00604-015-1446-3) contains supplementary material, which is available to authorized users. The authors express their appreciation to the Semnan University Research Council for financial support of this work.